MJ sent me the links so I could plug it as well. Awesome she is continuing it in honor of Tina. And you did a great job with the graphic - as always! Bless you Jeremy for this. I wish you a happy Monday, sir. This is a wonderful cause and she is still missed by many. A great plan. 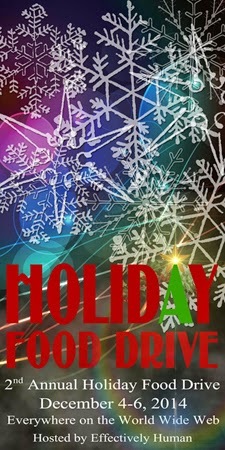 We already participated in two drives before Thanksgiving and we'll be doing more in the coming weeks. that is a nice cause! So glad we get to work on this together again this year, Jeremy! Thank you so much for your support, encouragement and amazing logo! Looking forward to saturating the Internet with everyone! I always give to food drives. A worthy cause. You never cease to amaze me, which is stupid of me, s I should be used to it by now.